This is a quick and easy summer side dish that goes great with anything from a pasta dish to sandwiches. I began roasting most of my dishes a couple of years ago, and it has made all the difference in the taste, and the quantity of vegetables we eat. It is alot easier to eat alot of vegetables when they taste as good as these do. Preheat oven to 400 degrees. Wash green beans and snap ends. let them drain. Wash tomatoes. 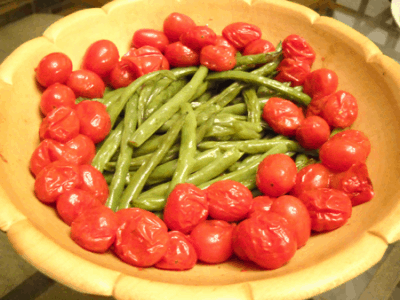 Place green beans in a baking dish and drizzle with olive oil and sprinkle with kosher salt and dried herbs. Roast at 400 degrees until tender, but still bright green, about 15-20 minutes, depending on size. Then place the tomatoes in a baking dish and drizzle with olive and sprinkle with kosher salt and dried herbs. Roast them for about 10 minutes, or just until they start to burst. Serve warm. Thanks for adding another dish to my dinner. This will be great with the sweet and sour chiken (steak). Now, I could use a starch. Let’s see of I can complete my meal here. Regardless, thanks for such good recipes. .-= Chaya´s last blog, Gooey Rocky Roader =-. Thanks for your post. I’ve been thinking about writing a very similar post over the last couple of weeks, I’ll most likely maintain it short and sweet and link to this instead if thats cool. Thanks. I like what you guys tend to be up too. This type of clever work and reporting! Keep up the excellent works guys I’ve incorporated you guys to my own blogroll.